Valentine’s Day will be here soon, and that special day plus the debut of a new book seems like the perfect pairing for a giveaway, right? I am ever grateful to everyone who buys and gifts and shares about my books! Every purchase and every personal note, email, social media comment, and review encourages me and reminds me who I write for—you, your children, and your grandchildren. Thank you for loving God’s Word and appreciating my efforts to help you know and love Him more. And thank you for making it possible for me to keep doing what I love—creating books to make God’s wonders known to the next generation. 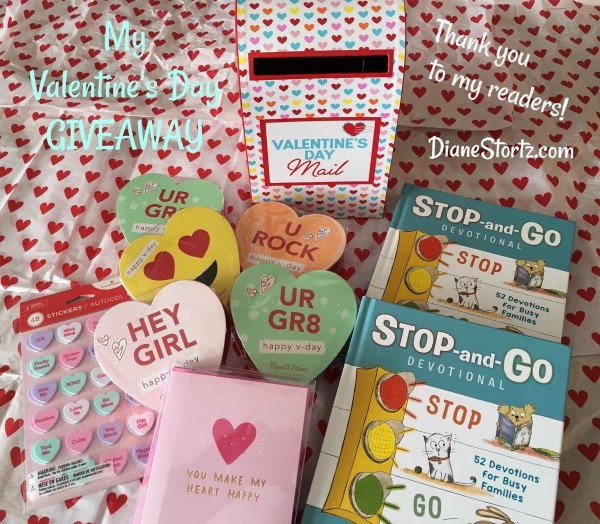 So to celebrate Valentine’s Day on February 14 and the release of Stop-and-Go Devotional: 52 Devotions for Busy Families on February 12, I think it’s definitely time for a giveaway! 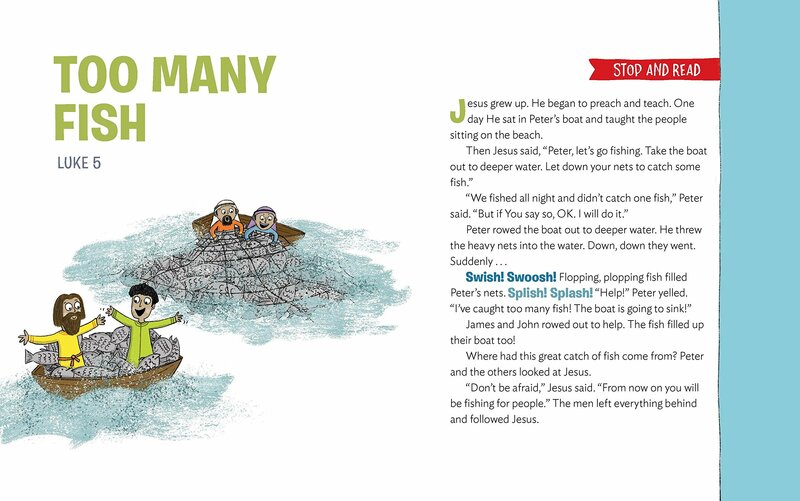 Stop-and-Go Devotions: 52 Devotions for Busy Families. 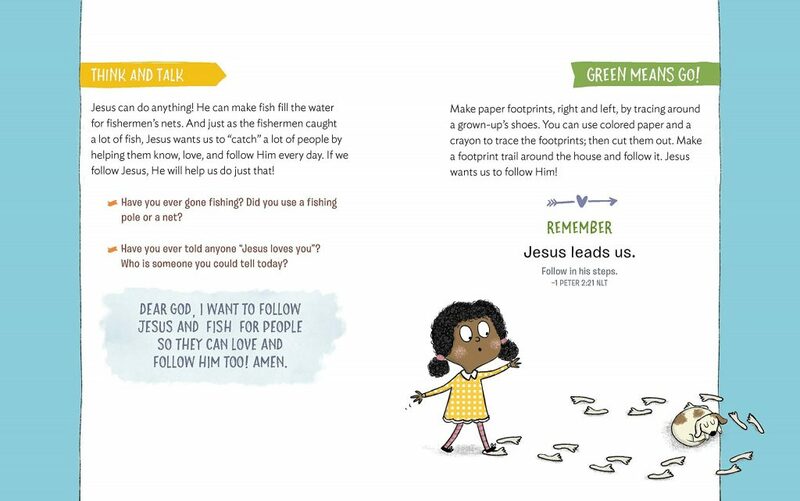 Each devotion features a short, active Bible story, questions to think and talk about, a simple, fun activity, a Bible verse, and a prayer. If you use the elements of one devotion at different times throughout one week, you’ll have enough devotional material to last all year! Everything you see in the photo at the top of this post will arrive at the home of one lucky winner in time for your own Valentine’s Day activities. The giveaway starts now and ends at 11:59 EST on Sunday, February 3. Just comment “I’d love to win” below this post and you’ll be entered. (Entries limited to US and Canada.) I’ll announce the winner on Monday, February 4. I’d love to win for my daughter and grandchildren. Thanks, Diane! I d love to win! I’d love to win for my kids 😊 We love your books! I’d love to win for my granddaughters! Thank you! I’d love to win your delightful family devotional book and prize pack for Valentine’s Day! I would love to win! Thanks for all you do to encourage families to draw closer to the Lord and each other. This devotional looks awesome and would be such a blessing for me and my girls. I’d love to win to share with my 4 kids and hubby! Although you may see I’m writing from the UK, I do have a permanent US address. I’d love to win! <3 Thanks! I would love to win! Thank you so much.